NOW...IMPORTANT...The size of a drill press is called the "Swing".. and what that means is 2X the distance from the drill bit to the riser arm... So.. if you have an 8 inch drill press you only have 4" from the chuck to the riser arm.. guess what.. you can reach the locations for the bridge posts.. but not the stop tail posts.. so up hte hill i'd go and drill a few bodies at once..
DO NOT buy an 8" drill press thinking you will be able to build a Les Paul with it... you can drill every hole EXCEPT the two holes for the stop tail... I found this out the hard way years ago..... get the biggest press you can afford. you can set your table with a bubble level to horizontal.. but, it NEEDS to be square to the CHUCK..
First, your gonna want to make a wooden "overtable" and attach it to the metal table on your press. not only can you get a bigger surface area to work with, but it helps the workpiece from sliding around as much as there is more friction to hold in it place. this is fairly simple but, i can post pics of that too if anyone wants to see it..
Take a piece of thick, somewhat stiff wire, i usually use a coathanger, but I used a piece of 10 gauge wire left over from a shop electrical project. Just make sure that the end going into the chuck is straight. then bend the wire so that it will make the largers circle possible on the table as the press spins. NOW... by hand.. turn the chuck one revolution and watch the wire.. if it touches anywhere, the table is not level to the chuck. 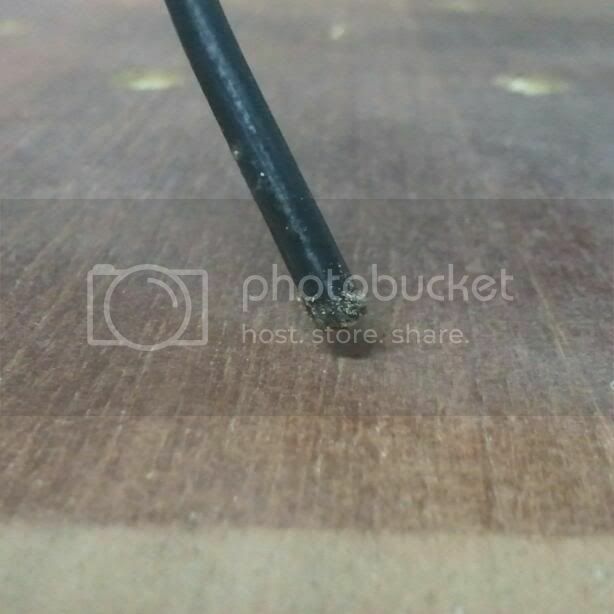 Most presses will have an adjustment for the table to tilt side to side, but few will also tilt back to front..
Now.. turn the chuck so that the wire is at the right side of the table and eyball or use a feeler gauge) the height of the wire off the table.. then.. turn the chuck so tha the end of the wire is on the left side of the table.. the gap shold be exactly the same as it is on the right. If it snot.. adjust your table and check again.. when your done, withteh side to side, lock the adjustment handle good and tight. Now.. check front to back.... here's where it gets tricky becasue there usually isn't and adjustment for this on lower priced presses... BUT.. becasue we bolted the overtable onto the metal base table.. we can adust it, by loosening the attachment bolts and sliding a piece of veneer under the front or othe back and then re-tightening the bolts (or screws). in my case... it took one piece of veneer under the front of the table to get it level front to back! now your table is square to the chuck and you can be sure your drilling straight holes!!! That is a great tip!! I've been meaning to build a aux table for my dp and I'm going to use your method. Here is another tip (if you dont mind) to get any width size from your drill press. 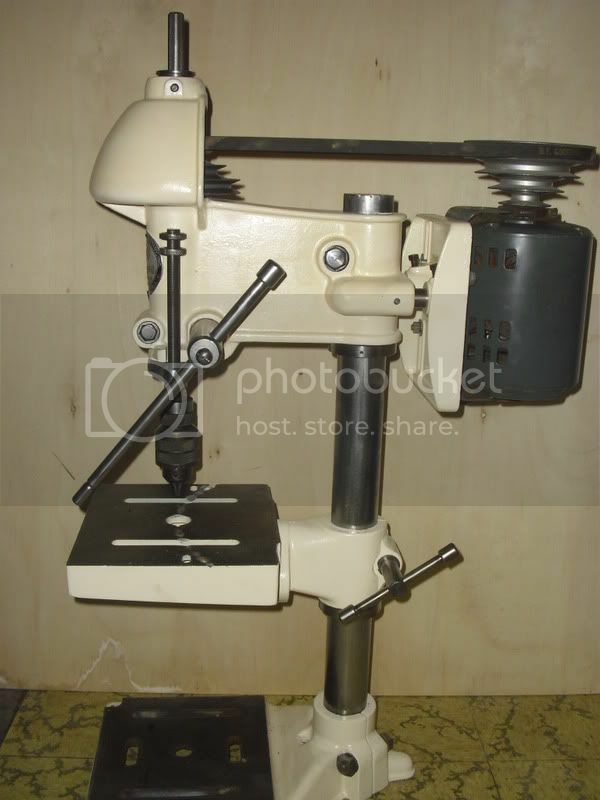 I happen to like older drill presses (I have 3 right now,,two 15'' and a 13'') because I feel they are built better. The only disadvantage is many have horrible table raising adjustments or none. 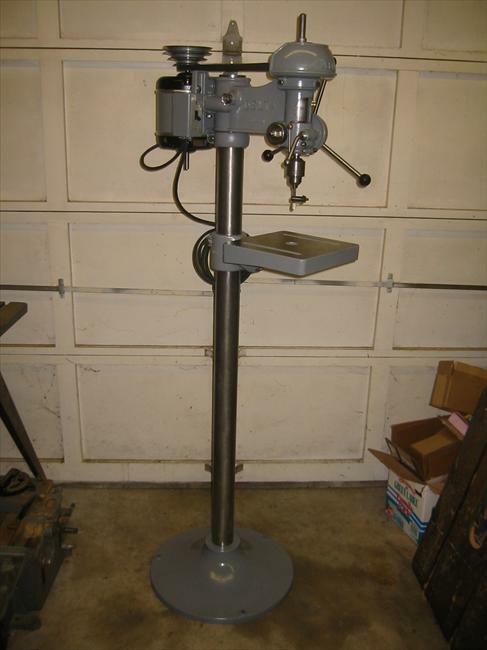 But,,,with the older style drill presses, you can remove the column,, ditch the table,,,and screw the base to ceiling beams and re-install the drill press head on the end that hangs down. Now you can put any kind of bench/table under the DP and have total clearence all around. Sounds scary but I have seen it done safely quite a few times. Could this not be done with a 5' level using the outer level on the ends (the longer out you go the more accurate) and x y and z axis' as long as the board is flat like 3/4" plywood? ummm.. not quite getting what your saying there. without the wire in the chuck, you have no reference point to line up the base. And.. 5 foot is a bit much anyway.. Honestly, I think this method is more than accurate enough for drilling tuner holes and bridge posts! We're not building nuclear weapons here! I ended up with my new press becasue after i drove a half an hour to buy an old delta press, the guy sold it. I was sooooooo pissed. But that thing is SWEEET! 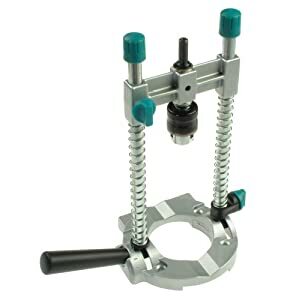 I usually try to stay out of the Luthier's Corner (as I have NO business being in here... ), but I'm about to drop some coin on a drillpress myself, and appreciate the OPs effort to offer us a simple and efficient means of leveling the baseplate. Better than using a piece of angle iron, that's for sure. Much obliged, Shane. about keeping it level to the drill chuck I think. D'oh... Mine is 8". the good thing is I'm a newb and I'm building a Tele, I guess I'll have to worry about that after a couple of builds. BTW, why is not possible? yeah if you can drill bridge posts which are further inward why not stop tails which are closer to the edge? You'll have the same problem with a Tele. 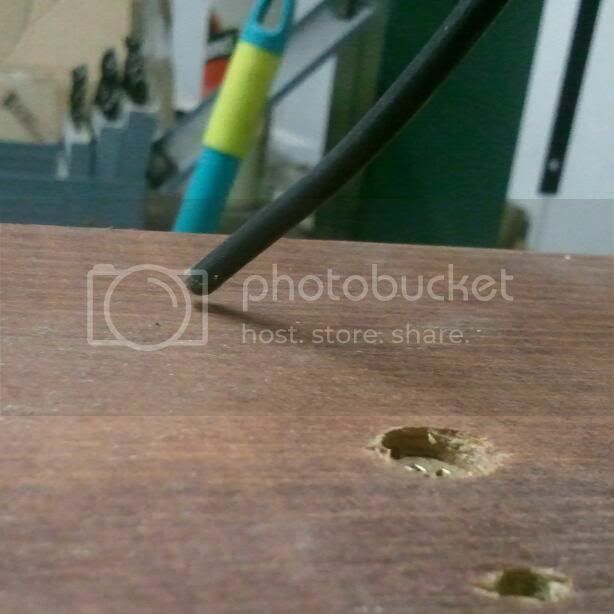 You need more swing than an 8" drill press provides to drill the string-through & bridge holes. If you look at an LP, you'll notice that the bridge post holes are actually closer to an edge (the waist) than the tailpiece holes. 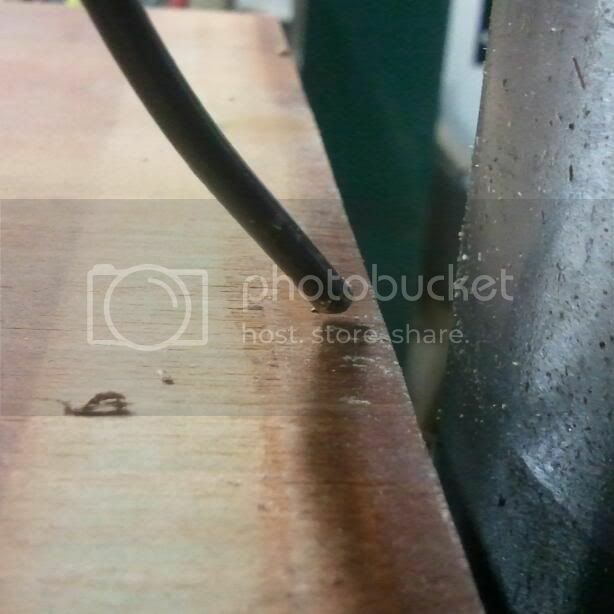 The tailpiece holes require a larger drill press than the bridge post holes. excellent tip, too simple. man I over complicate things. A level will make the table level to the earth/floor and will not do anything with the relationship between the chuck axis and the table. Table will be level but the drill bit could be coming in at an angle. You want the chuck to be perfectly square to the table so relationship to level is not important. This is a great tip. This one definitely took me a second to get my head around. Once I had the "Aha" moment its makes perfect sense and is a brilliant way of doing this. I can't remember how I setup my drill press, but I can say it wasn't this easy. Thanks for the great tip. This thread also reminded me that I should start looking for a new drill press. Well, you have three options, as I see it. 1. Exchange/sell your 8" drill press for a 10" or 12" one (get a used one off of Craigslist--I got my 12" benchtop '70s Taiwan jobbie for $100). 2. If you've got the ability, modify your current 8" drill press for more swing by cutting off the column and making a coupler for it. A Google search will show a bunch of examples. 3. Use your current drill press to make a guide for a hand drill. Edit: just noticed you're a Porteno, so Craigslist is out. Che boludo. Look at options #2 or #3, then. Dude.. you have NO IDEA how much I overcomplicate things.. Part of the ADD I think.. BCR Greg used to tel me to lean over so he could smack me on the top on the head at least once a day because i was trying to create a nuclear bomb on my side of the bench rather than just drilling a freakin hole!!! Yeah.. If the old man had not showed me that trick.. i'd be tring to figure out how to use a laser level and a protractor os some crap!!! just LOOK at this baby.. MMMMMMMMMMmmmmm. Youotyher options are to check out something like what Baraby uses.. Its a rig to put a hand drill in what looks like a plunge router base.